Pregnancy is a time of big changes and not only in your body either! While it goes through a very demanding development process, it can be a lot of pressure on you emotionally. You may not feel too great, battling the sickness, swollen feet and insomnia, so it’s time for us to give you the feel of awesomeness and beauty. We can do your bump photography session either at our photo studio in St Austell or on location in Cornwall. There are plenty of gorgeous places locally, one of the most favourite being a beach. We will discuss the best location for the maternity photography during the the initial conversation before the photo session. If you prefer cosy indoors, we will gladly accommodate that at the studio. You are welcome to bring up to 3 outfits of your choice for yourself and your partner and kids, should they wish to join the photo session. With the different interior options, there will be lighter and darker sets, so we recommend to go with plain natural colours smart or smart-casual outfits in darker and lighter shades, without distracting patterns and stripes. After the session we schedule the in-person viewing session which usually takes place 1 week later. Then you come to see your edited images presented in the slideshow and choose the photo package and wall art. We have lots of samples available for you to select the most suitable option for your home! Maternity bump photography session is £35 at the studio or on location within 7 miles of St Austell. The locations of 7+ miles are charged at £15 extra. You can choose to add this option when checking out. Unlike other photographers, we do not hide our photo packages prices. Please view them below. Q: What should I wear for the session? A: On the day we always recommend to bring sets of black and white lingerie and black and white tank tops or plain t-shirts for mums-to be, as well as the nute colour lingerie set. We can supply the rest, and you are welcome to use some gowns from our maternity closet. For partner shots, it is recommended he brings a plain dark shirt/t-shirt without distracting patterns and logos, and the white one as well. 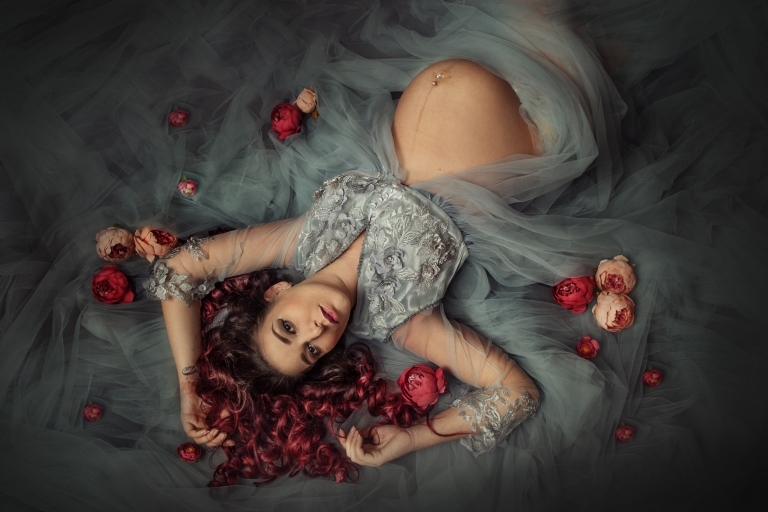 We are happy to offer you our growing gown collecttion for the maternity photo sessions! Please see the images in the gallery to see them in use. Q: Can we bring our older children for the maternity session? A: Yes of cause! They are mostly welcome to join! For clothes please bring smart shirt and trousers for boys and Sunday best dress for girls. We may have outfits for them too!